Clark School Aerospace Engineering students won three out of the top four spots in the graduate student paper competition at the 2013 American Institute of Aeronautics and Astronautics (AIAA) Region I Young Professional, Student, and Education (YPSE) Conference held November 15, 2013 at John Hopkins University Applied Physics Laboratory. Shrestha is currently a Graduate Research Assistant at the Micro Air Vehicle Lab under the guidance of Dr. Inderjit Chopra. She was also previously awarded the Vertical Flight Foundation (VFF) scholarship as an undergraduate student in Aerospace Engineering at the University of Maryland (UMD) in 2012. Her research focuses on the development of the cyclocopter, a micro air vehicle that utilizes cycloidal rotors, and she has made history with the very first cyclocopter ever reported in literature to successfully achieve hover and forward flight. Shrestha's paper describes the design, development and forward flight testing of a cycloidal-rotor aircraft (cyclocopter) at Micro Air Vehicle (MAV) scale. Cycloidal rotor (cyclorotor) is a revolutionary vertical take-off and landing concept, which has both a horizontal axis of rotation with the blade span parallel to axis and cyclically pitching as it goes around the azimuth to produce a net thrust. Limparis is a Ph.D. student at UMD's Space Systems Laboratory. He received both his B.S. in Electrical Engineering and a M.S. in Aerospace Engineering from UMD in 2008 and 2012 respectively. Limparis is also a scientific diver with over 50 hours of underwater time working with robotic systems at UMD'S Neutral Buoyancy Research Facility. His research involves the study and application of robotics for the space environment as well as the deep ocean environment. Currently his focus of study is on highly coupled dynamics between a space manipulator and a similarly massed host spacecraft in order to generate better dynamical models to improve the viability of small and inexpensive robotic satellite servicing missions. Geerts is a master's student with the Advanced Propulsion Research Laboratory under the guidance of Dr. Kenneth Yu. His presentation, entitled "Enhancement of the Background Oriented Schlieren (BOS) Method through Component Optimization," described efforts to refine a non-traditional flow visualization technique for the study of confined shock-boundary layer interactions in scramjet related flowfields. 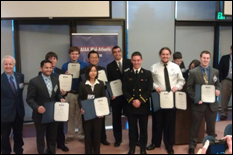 Aerospace Engineering students also swept the AAIA YPSE Conference's Space Robotics special category. The awards were won by Limparis and Kate McBryan (Advised by Akin), and Justin Brannan (advised by Dr. Craig Carignan). Congratulations to all of the student presenters who did such an outstanding job representing UMD's research programs at this conference! The AIAA YPSE Conference is intended to highlight the future of aerospace engineering from kindergarten to age 35. For more information, visit the AIAA YPSE Conference website.